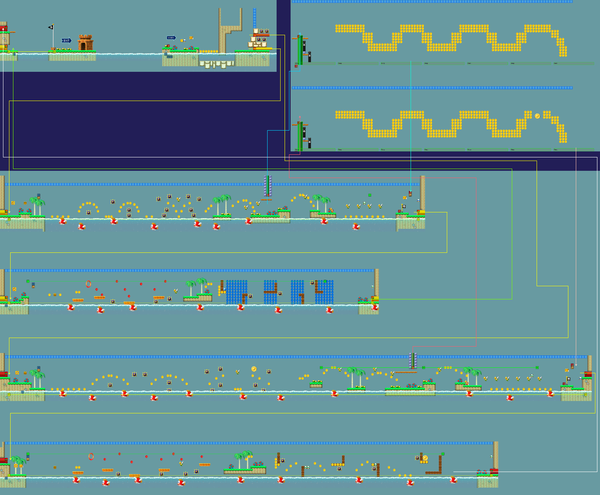 World 3-B is the second secret level of World 3 in New Super Mario Bros. 2. It is the first level with the Mini Mushroom and prominently features it, for the level must be completed with it. Completing this level will unlock World 3- skipping World 3- Ghost House and World 3-5. Mario begins in front of two ? Blocks in a forest, one of them containing a Mini Mushroom. Then, Mario has to swim past the wall through a small pool of water. There will then be a fork in the path. The player can choose to take either the yellow pipe or red pipe. Either way, warping through any will take Mario to an autoscrolling beach area. Yellow Pipe: The screen scrolls slower in this area. Mario begins in front of a Gold Block. Mario will need to dash on the water continuously until the end of the level. There are spiky objects in the air and Cheep Cheeps and Big Cheep Cheeps in the water. Also present are Koopa Troopas and Koopa Paratroopas. An area in the sky also has Bullet Bills. In the second area, in addition to all these, there are also many Brick Blocks which obstruct the player's path. Red Pipe: The screen scrolls faster in this area. This is basically the same as that in the yellow pipe, only with more spiky objects, more Koopas and Paratroopas, the presence of Star Coins, more Brick Blocks and the absence of the P-Switch in the second beach area. Both pipes lead to the same area, a jungle area with a small pool of water and the flagpole. If Mario took the red pipe earlier, he will come out from the pipe on an elevated orange platform, allowing Mario to easily touch the top of the flagpole. To find Star Coins in this level, Mario must take the red pipe path. 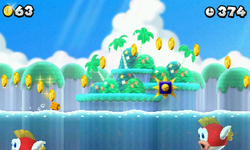 Star Coin 1: Mario needs to bounce off the first Paratroopa to reach this Star Coin while avoiding the spiky objects. Star Coin 2: Still in the first area, from the second piece of land which Mario comes across, he will need to bounce off a Koopa Troopa to reach an orange platform above and quickly enter the mini pipe. Then, Mario will need to continuously bounce on the Bullet Bills until he gets the Star Coin on the far right. Star Coin 3: In the second beach area, Mario will need to wall kick off a Brick Block wall to reach the Star Coin. It may take several tries before Mario can obtain it. This course is unique in that it has two checkpoints, one on each pipe. The other two courses with two checkpoints are World 6- and World Star - , as they are Bowser fights. The three courses are also unique in that they never appear in Coin Rush. In the case of World 3-B, a Mini Mushroom is required to complete it.